Established in 1993, for the last 21 years we have been providing a professional and efficient service to a large number of satisfied clients. 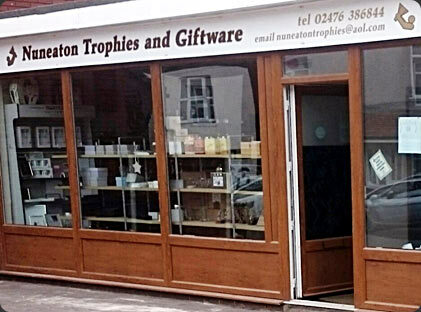 Our range of products ensure that no matter what type or size of organisation you are, and no matter what your sport or pastime, we can always provide you with the Trophies and Awards that you need. You will always be assured of excellent, friendly advice and service, combined with competitive prices for all of our products and engraving services. Please drop in, or talk to us soon, we really look forward to seeing you. (Note: We are closed All day Sunday and Monday). Although we have tried to show a good sample of our range of Trophies and Awards on this website, we do have many more. Please contact us for further information.